Austrian President Heinz Fischer becomes the first European head of state to visit Tehran since 2004. 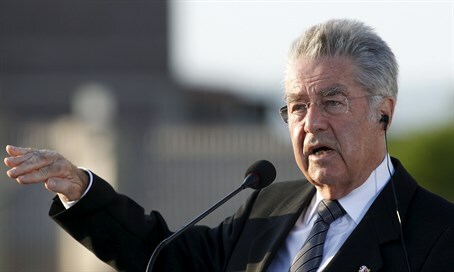 Austrian President Heinz Fischer was travelling to Iran on Monday, becoming the first European head of state to visit since 2004, his office said, two months after an international deal was struck over Tehran's contested nuclear program. During his three-day stay, Fischer is due to meet supreme leader Ayatollah Ali Khamenei, President Hassan Rouhani and Foreign Minister Mohammad Javad Zarif, one of the main negotiators of the historic agreement signed in Vienna on July 14 with six major world powers, according to an AFP report. The Austrian president is also set to attend an economic conference on Iranian-Austrian relations. Fischer, whose political role is largely ceremonial, will be accompanied by Vice-Chancellor Reinhold Mittelehner, Foreign Minister Sebastian Kurz and economic experts. It will be the first visit to Iran by a European Union head of state since Thomas Klestil, a former Austrian president, travelled there in January 2004, noted AFP. The long-awaited nuclear deal -- signed with Russia, France, Britain, China, Germany and the United States -- has cleared a path to lift sanctions that have crippled Iran's economy, and should re-open channels for foreign investment in oil and gas-rich Iran. Neutral Austria, which has long had good relations with Iran, is hoping for a five-fold increase in exports to the Islamic Republic, according to the Chamber of Commerce. Several other senior European figures already visited Iran this summer, including the EU's foreign affairs chief Federica Mogherini. More recently, Britain reopened its embassy in Tehran in a step of rapprochement, four years after an Iranian mob said to be directed by the government stormed the compound, forcing its closure. Late last month, German Foreign Minister Frank-Walter Steinmeier said he plans to travel to Iran in October, the latest sign that Europe's largest economy wants to quickly rebuild economic and political ties with the Islamic Republic. Steinmeier's visit follows a three-day trip last month by Economy Minister Sigmar Gabriel, who became the first senior figure from a large Western government to visit Tehran since it struck a landmark nuclear agreement with world powers. Following his July visit to Tehran, Gabriel faced criticism local Jewish groups and opposition lawmakers, but he brushed it off, saying the earlier sanctions against Iran only had "one concrete reason and that was the nuclear negotiations."